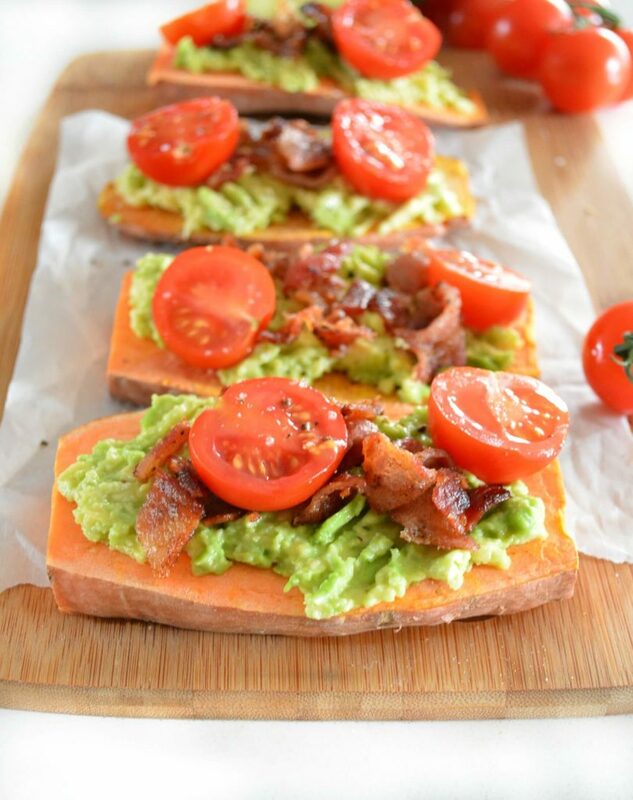 Waking up to a delicious breakfast is simple with the help of sweet potato toast. This convenient method of toasting sweet potato slices results in an oh-so-satisfying breakfast that is healthy to boot. Start with a large thick sweet potato and slice to ¼ inch thickness. Using a thick sweet potato allows for more slices of toast and more room to pile on the toppings. One large potato typically yields 4 slices. Place slices in toaster and toast on the highest setting. I find that 2 rounds of toasting on the 6 minute setting gets the job done. You can also pierce slices with a fork in the center to help them cook all the way through. Be sure to flip sweet potato slices over between cooking cycles to ensure that they are cooked from top to bottom. In the meantime, prepare the other ingredients. 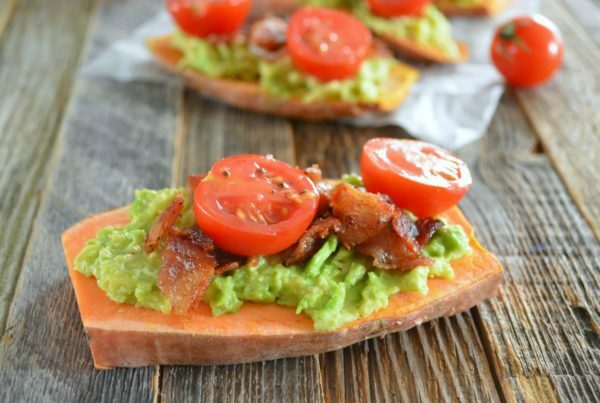 You can go sweet or savory when it comes to your toppings for sweet potato toast because it is so darn versatile. For this recipe I went the savory route using crumbled bacon, smashed avocado and sliced cherry tomatoes. This combination reminds me of a BLT sandwich, but much healthier. You can take it one step further and add a sunny side up egg for extra protein. If you love sweet potatoes as much as I do, this is a recipe you have to try. It also happens to be a fun and creative way to get kids to eat more veggies because you can slather the toast with their favorite flavors, from pizza toppings to almond butter. 1. Cut ends off sweet potatoes and slice into 1/4 inch slices. 2. Place sweet potato slices in toaster. Toast for 6 minutes. Flip over and toast once more. Some toasters may require additional toasting time. 3. Spread avocado over sweet potato slices. Top with crumbled bacon and tomato. Season with sea salt and black pepper.